RESEARCH. Stakeholder Interviews. Competitive Analysis. DIGITAL. Web Design & Build. 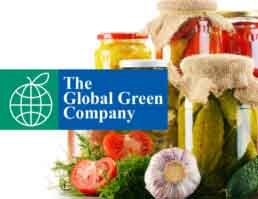 The Global Green Company is a leading diversified producer of processed vegetables and fruits with a presence in more than 50 countries. Originally set up in 1992 as a joint venture between India’s Thapar group and a European partner, the company quickly rose to become the third largest producer and processer of gherkins. In 1996, the Thapar Group, in a demonstration of its vision and commitment to the potential of Indian agriculture, acquired 100% stake in the entity. Despite being an international market leader, the company had an extremely poorly designed website with server errors and poor functionality, diminishing the stature of the organization and projecting it as a small and possibly dysfunctional domestic business. The company needed a well thought through website which worked seamlessly across devices and screen sizes, to establish in the minds of its partners, suppliers and customers, that it was indeed a business of noteworthy importance. We conducted an audit of select competitors in order to better understand the category, which allowed us to create a distinct and differentiated website for The Global Green Company. Noteworthy features of the website include strong imagery, easy navigation and liquid design. The new website helped breathe fresh life into the Global Green Company’s on the brand-side. Post the website going live, there has been an increase in site-visits, enquiries and general interest in the company’s business operations.